Everyone talks about it, but by the time it comes down to actually making it I can’t find one good recipe. Except this one. This Easy Peasy Quinoa Tabbouleh is basic enough to make with your eyes closed. I made it three different times yesterday. And not for any reason other than the fact that it’s insanely delicious and my friends kept wanting more post our Physique 57 workout. If I have the patience to make this three times in a row, then you can make it once (or twice). This is a great dish to keep in the fridge and serve with lunch or dinner. 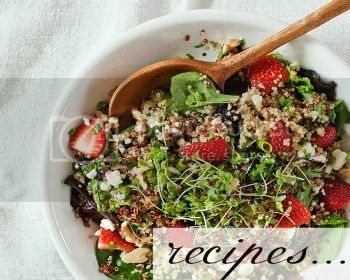 This is a Mediterranean inspired recipe healthified with the use of quinoa instead of bulgur wheat or couscous, and jazzed up with a tangy lemon vinaigrette and vine-ripened tomatoes. You don’t even need to have experience in making quinoa to put this together. Just be sure to purchase pre-rinsed quinoa, or to rinse your quinoa thoroughly before boiling to release all of the saponins that make the quinoa bitter. Another good trick is to salt the water before boiling to speed up the process and add flavor to your quinoa. For more, just double or triple the recipe. An easy mediterranean quinoa tabbouleh recipe inspired by Bon Appetit's Quinoa Tabbouleh. Bring quinoa, ½ tsp. salt, and 1¼ cups water to a boil in a medium saucepan over high heat. Reduce heat to medium-low, cover, and simmer until quinoa is tender, about 10 minutes. Remove from heat and let stand, covered, for 5 minutes. Fluff with a fork. If serving later, wait to pour dressing over and store in the refrigerator separately. Yes you can! It’s delicious! I made this yesterday. Today, it’s all gone. Sooooo yummy – loved it! Thank you!